NCERT Textbook Solutions are considered extremely helpful when preparing for your CBSE Class 9 Physics exams. TopperLearning study resources infuse profound knowledge, and our Textbook Solutions compiled by our subject experts are no different. Here you will find all the answers to the NCERT textbook questions of Chapter 12 - Sound. All our solutions for Chapter 12 - Sound are prepared considering the latest CBSE syllabus, and they are amended from time to time. Our free NCERT Textbook Solutions for CBSE Class 9 Physics will strengthen your fundamentals in this chapter and can help you to score more marks in the examination. Refer to our Textbook Solutions any time, while doing your homework or while preparing for the exam. When an object vibrates, it forces the neighbouring particles of the medium to vibrate. These vibrating particles then force the particles adjacent to them to vibrate. In this way, vibrations produced by an object are transferred from one particle to another till it reaches the ear. When the school bell is struck with a hammer, it starts vibrating and as a result of these vibrations, sound is produced by the bell. Sound waves force the medium particles to vibrate. Hence, these waves are known as mechanical waves. Sound waves propagate through a medium because of the interaction of the particles present in that medium. Since the presence of the medium is essential for the sound waves to travel, sound waves are known as mechanical waves. Sound needs a medium to propagate. Since the Moon is devoid of any atmosphere, I will not be able to hear any sound on the Moon. (a) The loudness of a sound is determined by its amplitude. If the amplitude of a sound is large, then the sound produced will also be loud. (b) The pitch of a sound depends on its frequency. A sound will be considered a high pitched sound, if its frequency is high. The frequency of the vibration of a sound produced by a guitar is greater than that produced by a car horn. Since the pitch of a sound is proportional to its frequency, the guitar has a higher pitch than a car horn. 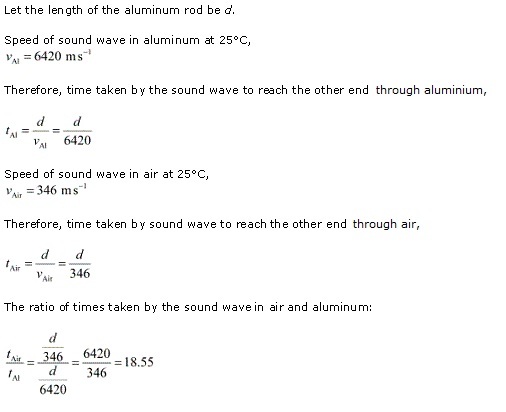 NCERT Solution for Class 9 Physics Chapter 12 - Sound Page/Excercise 166 cont. 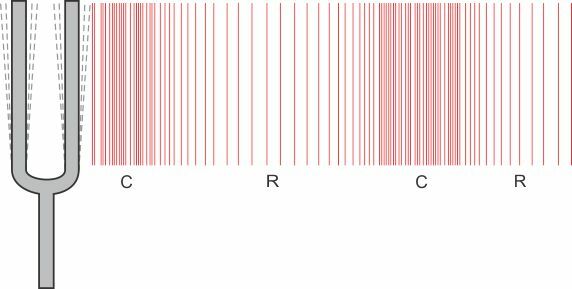 Wavelength: The distance between two consecutive compressions or two consecutive rarefactions is known as the wavelength. Its SI unit is metre (m). Frequency: The number of complete oscillations per second is known as the frequency of a sound wave. It is measured in hertz (Hz). Time period: The time required to produce one complete sound wave (or cycle) is called time period of the sound wave. Amplitude: The maximum height reached by the crest or trough of a sound wave is called its amplitude. 1. Loudness of a sound is the sensation produced in the ear which enables us to distinguish between a loud and a faint sound. 1. 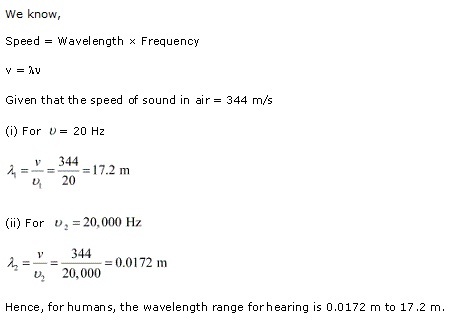 Intensity of a sound wave is defined as the amount of sound energy passing through a unit area per second. 2. It is not an entirely physical quantity. 2. It is a physical quantity which can be accurately measured. 3. It depends on the sensitivity of the ears. 3. It does not depend on the sensitivity of the ears. The speed of sound depends on the nature of the medium. Sound travels the fastest in solids. Its speed is lesser in liquids and the least in gases. Therefore, for a given temperature, sound travels fastest in iron (which is a solid). In the given interval of time, sound has to travel a distance that is twice the distance of the reflecting surface and the source. The audible range of an average human ear lies between 20 Hz to 20,000 Hz. Humans cannot hear sounds having frequency less than 20 Hz and greater than 20,000 Hz. Sound is a form of energy which produces sensation of hearing. It is produced due to vibrations of different objects, e.g. vibrating string of a guitar, vibrating air in a flute etc. When a vibrating body moves forward, it creates a region of high pressure in its vicinity. This region of high pressure is known as compressions. When it moves backward, it creates a region of low pressure in its vicinity. This region is known as a rarefaction. As the body continues to move forward and backwards, it produces a series of compressions (C) and rarefactions (R) (as shown in the following figure). 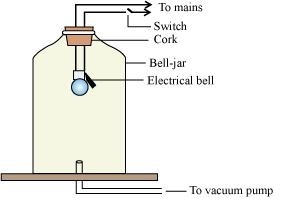 Take an electric bell and hang this bell inside an empty bell-jar fitted with a vacuum pump (as shown in the following figure). Initially, one can hear the sound of the ringing bell. Now, pump out some air from the bell-jar using the vacuum pump. It will be observed that the sound of the ringing bell decreases. If one keeps on pumping the air out of the bell-jar, then at one point, the glass-jar will be devoid of any air. At this moment, no sound can be heard from the ringing bell although one can see that the prong of the bell is still vibrating. When there is no air present inside, we can say that a vacuum is produced. Sound cannot travel through vacuum. This shows that sound needs a material medium for its propagation. The vibration of the medium that travels along or parallel to the direction of the wave is called a longitudinal wave. In a sound wave, the particles of the medium vibrate in the direction parallel to the direction of the propagation of disturbance. Hence, a sound wave is called a longitudinal wave. Quality of sound is that characteristic which helps us to identify a particular person’s sound. Sound produced by two persons may have the same pitch and loudness, but the quality of the two sounds will be different. The speed of sound (344 m/s) is less than the speed of light (3 x 108 m/s). Sound of thunder takes more time to reach the Earth as compared to light. Hence, a flash is seen before we hear a thunder. Hence, the source vibrates 6000 times in a minute, producing a frequency of 100 Hz. Sound follows the same laws of reflection as light does. The incident sound wave and the reflected sound wave make the same angle with the normal to the surface at the point of incidence. Also, the incident sound wave, the reflected sound wave, and the normal to the point of incidence all lie in the same plane. An echo is heard when the time interval between the original sound and the reflected sound is at least 0.1 s. The speed of sound in a medium increases with an increase in temperature. Hence, on a hotter day, the time interval between the original sound and the reflected sound will decrease. Therefore, an echo might not be heard on a hot day as the echo can be heard only if the time interval between the original sound and the reflected sound is greater than 0.1 s.
(i) Reflection of sound is used to measure the distance, direction and speed of underwater objects. This method is known as SONAR. (ii) Working of a stethoscope is also based on reflection of sound. In a stethoscope, the sound of the patient's heartbeat reaches the doctor's ear by multiple reflection of sound. Persistence of sound (after the source stops producing sound) due to repeated reflection is known as reverberation. As the source produces sound, it starts travelling in all directions. Once it reaches the wall of a room, it is partly reflected back from the wall. This reflected sound reaches the other wall and again gets reflected partly. Due to this, sound can be heard even after the source has ceased to produce sound. To reduce reverberations, sound must be absorbed as it reaches the walls and the ceiling of a room. Sound absorbing materials like fibreboard, rough plastic, heavy curtains, and cushioned seats can be used to reduce reverberation. The sensation produced in the ear which enables us to distinguish between a loud and a faint sound is called loudness of a sound. Loudness of a sound depends on the amplitude of the wave. In fact, loudness is proportional to the square of the amplitude. A bat produces high-pitched ultrasonic squeaks. These high-pitched squeaks are reflected by objects such as preys and returned to the bat's ears. This allows the bat to know the distance of his prey and hence catch it. Objects to be cleaned are put in a cleaning solution and ultrasonic sound waves are passed through that solution. The high frequency of these ultrasound waves detaches the dirt from the objects. SONAR is an acronym for Sound Navigation And Ranging. It is an acoustic device used to measure the depth, direction and speed of under-water objects such as submarines and ship wrecks with the help of ultrasounds. It is also used to measure the depth of seas and oceans. 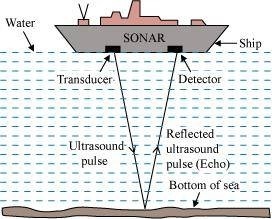 A beam of ultrasonic sound is produced and transmitted by the transducer (it is a device that produces ultrasonic sound) of the SONAR, which travels through sea water. The echo produced by the reflection of this ultrasonic sound is detected and recorded by the detector, which is converted into electrical signals. The distance (d) of the under-water object is calculated from the time (t) taken by the echo to return with speed (v) and is given by 2d = v × t. This method of measuring distance is also known as ‘echo-ranging'. Defects in metal blocks do not allow ultrasound to pass through them and so they are reflected back. This fact is used to detect defects in metal blocks. Ultrasound is passed through one end of a metal block and detectors are placed at the other end. The defective part of the metal block does not allow ultrasound to pass through it. As a result, it will not be detected by the detector. Hence, defects in metal blocks can be detected using ultrasound. Different sounds produced in our surroundings are collected by pinna that sends these sounds to the ear drum via the ear canal. 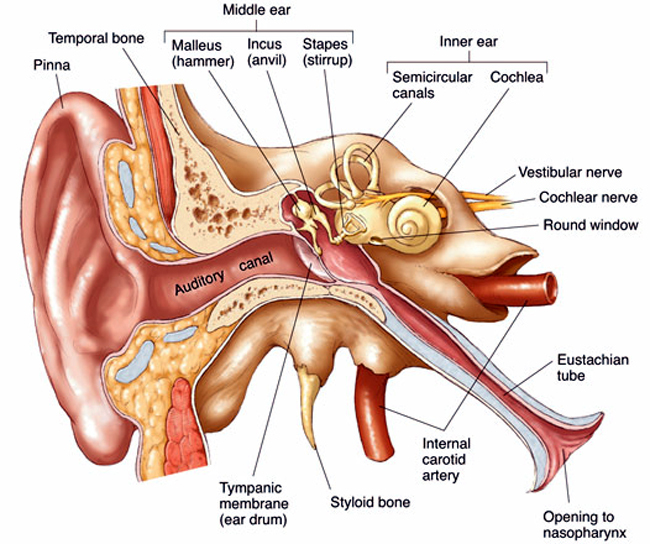 The ear drum starts vibrating back and forth rapidly when the sound waves fall on it. The vibrating eardrum sets the small bone hammer into vibration. The vibrations are passed from the hammer to the second bone anvil, and finally to the third bone stirrup. The vibrating stirrup strikes on the membrane of the oval window and passes its vibration to the liquid in the cochlea. This produces electrical impulses in nerve cells. The auditory nerve carries these electrical impulses to the brain. These electrical impulses are interpreted by the brain as sound and we get a sensation of hearing. TopperLearning provides step-by-step solutions for each question in each chapter in the NCERT textbook. Access Chapter 12 - Sound here for free.